Looking for private in-home or in-studio Harp lessons? Our Harp teachers are ready to get you started. Find your teacher today! The average cost of 60-minute harp lessons is $80. While the exact cost will vary depending on the teacher, type of lesson, and your location, you should expect to spend anywhere between $40 and $201 per hour. For the best experience, we typically recommend 60-minute harp lessons. However, students looking for a more affordable option may want to consider a shorter lesson length of 45 or 30 minutes. On average, 45-minute harp lessons are 22% less expensive at $63, and 30-minute lessons cost 43% less at $46. Curious how much harp lessons cost in your area? Do a quick search to get local prices for the best harp teachers . "Lydia is very helpful and goes beyond the norm to help you learn. She gives great ideas. She is very knowledgeable and an excellent harpist." Columbus, OH teacher: Lydia H.
" book and I am now at an intermediate level. Lessons were enjoyable and relaxed while still being focused and informative. I am very happy with the progress I have made with Anne and would recommend her as a teacher." Sacramento, CA teacher: Anne R.
. Lydia has to gift to do that." "Love my harp lessons and my teacher!" Bloomington, IN teacher: Sara C.
"I’ve studied harp with teacher Eleonora for five years. She’s a very knowledgeable and patient person as well as kind and available. ching method. The most important thing: she puts energy and passion in every thing she does. She’s the best harp teacher I could ever have!" mes. She is an excellent and very flexible teacher, working with you to achieve your goals for the instrument - classical or improvisational, or both. I am looking forward to learning more about the therapeutic application of the harp in my field of integrative medicine." Honolulu, HI teacher: Amanda O.
Trenton, NJ teacher: Liudmila I. "We really enjoy our weekly lessons with Lydia"
d follow time signatures. Anne’s patience and positive attitude have guided me into a wonderful joy on a lifelong dream to play music. She truly loves what she does and enjoys teaching others." The harp is my favorite instrument. I currently offer lessons from beginner to intermediate levels. My method of teaching harp is unique because I teach both learning styles of "right-brained" (intuitive, creative, expressive, and improvising) with the "left-brained" style of logic, order, organization, theory, structure, and sight-reading. You will learn proper technique, grace, and expression, as well as the ability to flow with the music, or let the music play "through" you. For this, there are different patterns which are learned in the left hand while the right hand improvises melodies. You will learn how to embody music and carry it through your instrument. In addition, I can also teach about therapeutic music according to the ancient "modes" of music and their effects on our different emotional states. In this way, you can help to comfort others (and yourself) through your harp playing--making practicing a fun and enjoyable activity! My daughter has been learning Ukulele with Amanda for 2 months. she likes Amanda so much, saying that Amanda has the most beautiful voice. In 2 months, my daughter learned to sing several songs she liked while playing Ukulele, it was amazing and very happy experience. Thank you for teaching Mary the ukulele. She loves learning with you. The harp is a beautiful instrument with roots as far back as Biblical times in Egypt and Mesopotamia. If you would like to learn to play such divine music, the harp is indeed the best choice for your musical instrument. 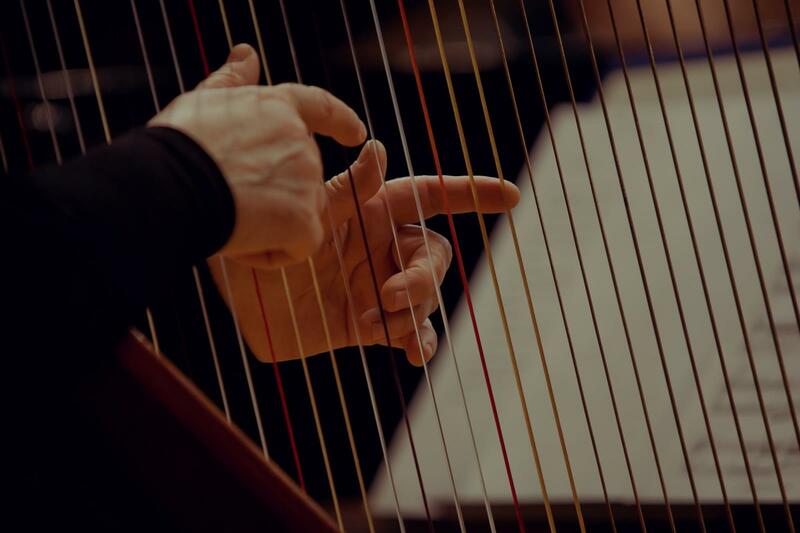 When looking for a harp instructor make sure that you select a teacher that has experience with the same musical style you are looking to play. Selecting which genre you would like to play important because this will determine how a teacher will develop your lesson plans. Nevertheless, whatever type of harp music you are interested in, we will do our best to match you with the perfect mentor for your harp lessons. All our teachers are certified professionals who are dedicated to helping you learn your musical instrument of choice. Add to that their friendliness and you have a winning match. Start your harp lessons with one of our wonderful instructors today!